Heat oven to 375°F. Lightly spray 24 mini muffin cups with cooking spray. In medium microwavable bowl, microwave semisweet baking chocolate and shortening on High until smooth and melted. Pour onto ungreased cookie sheet. Using spatula, smooth chocolate into a thin layer; set aside to harden. In large bowl, mix Cookie Cup ingredients until a crumbly dough forms. Shape dough into small balls; place each into muffin cup. Bake 10 to 11 minutes or until set and very light golden brown (dough will puff slightly). Using end of rolling pin handle or spoon, press indentation in center of each cookie to form cup. Cool completely in pan, about 15 minutes. 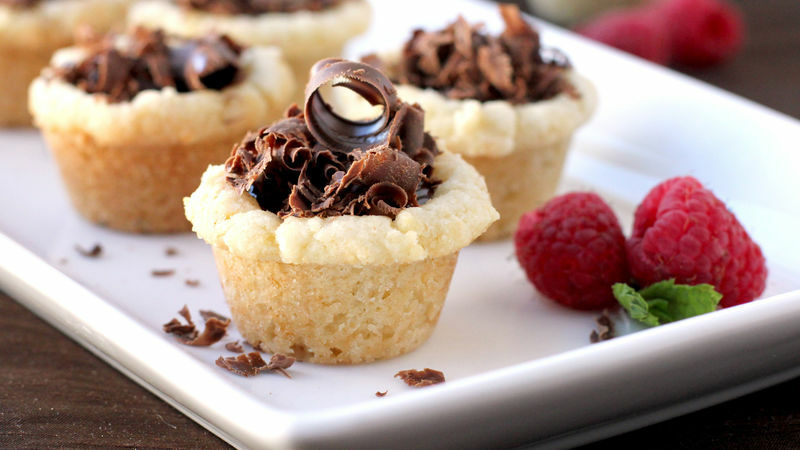 Remove cookie cups from muffin cups to cooling rack. Meanwhile, to make curly chocolate shavings, use metal spatula to scrape a thin layer of chocolate from metal cookie sheet by sliding spatula edge quickly just under layer of hardened chocolate. In small microwavable bowl, microwave dark chocolate chips and whipping cream on High until chocolate is melted; stir until smooth. Spoon filling evenly into each cookie cup. Press chocolate curls gently into center of each cookie cup. Let filling cool completely before serving. Candy Toppings. Create colorful, whimsical truffle cups by pressing mini chocolate candies into the center of each cookie cup rather than the chocolate shavings. Double Chocolate. Try making this recipe with Betty Crocker® double chocolate chunk cookie mix for twice the chocolaty goodness!